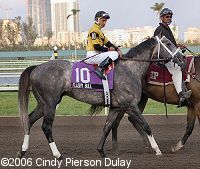 Note: Second in the Remsen last year, he was 4th in the Holy Bull on the slop for his first start of 2006. He finished a close third in the Fountain of Youth and was moved up to 2nd after Corinthian was disqualified for coming out in the stretch. Took a big step backwards in the Florida Derby where he faltered to finish 7th. Never a factor in the Derby, finishing 14th.